Sorting your to-do items ensures that you can find your most important items first. You have a range of options to sort your To-do list using the sort & filter menu. Drag & drop: Items will display based on the customized order you have chosen with the drag and drop function. Karbon will remember this order, even if you choose to sort or filter your items by something else. To-do date: Items will display based on day that was set to be done. This filter is popular in This Week and Next Week to-do periods to see items by day and organize the week. Due date: Items will display based on when the day they are due. An item with no due date will be included under the section “No due date”. Status: Use this filter to see items based on progress status. For example, you might want to see "planned" or "ready to start" items. Last updated: Items will display based on their latest activity timestamp. Work: Items will be categorized by the piece of work they are a part of. Items that don't belong to any work item will be clustered under the section “Not part of work”. If there is an email attached to multiple work items, it will be listed under the primary work item. Client: Items will be grouped by the client they are associated with. If an item is not linked to a client, it will be included under the section “Not linked to a client”. Assigner: Items will be categorized by who has assigned the item. Very handy if you are looking at prioritizing your partner's requests. Assignee: Items will be grouped by colleague who assigned the items. All sorting views except for “Drag & drop” will split your items into sections. You will be able to expand and collapse these sections as well as bulk update them. 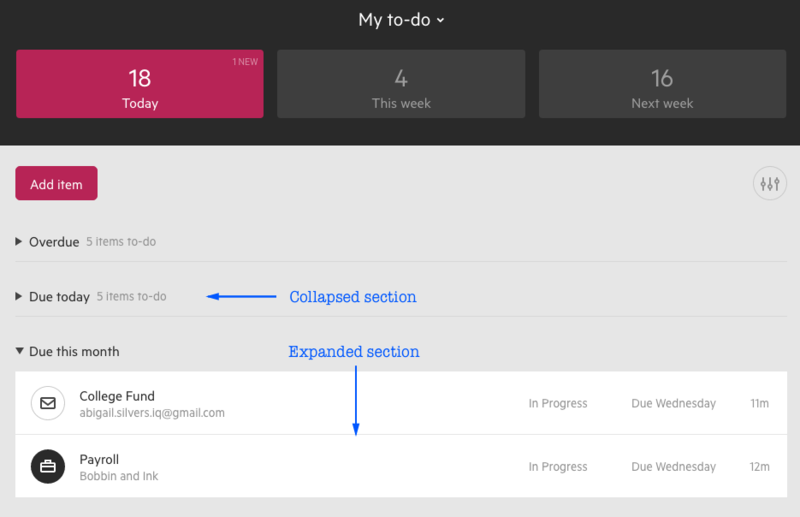 Additionally, you can filter your to-do list to further prioritize your list.